Barging through books at three to five a week, I needed a couple of breaks from the solitude and the holiday tourists aboard the ship, so I called Maggie – she and Kim and I went “boat shopping” at Target and Wal-Mart in Ft. Lauderdale for stuff we just can’t get in Panama. Kind of boring for a “girls’ day out” but boy did I feel like a millionaire hoarding the stuff we have been looking forward to getting! 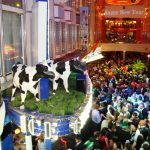 The only problem seemed to be getting off the ship and getting a taxi without ripping somebody a new one. I HATE crowds, and a turnaround day in Ft. Lauderdale is enough to turn me into a complete recluse. We were able to get a great Christmas tree for the cabin, and I went decoration shopping in San Juan so we could make the place look wintry and cozy. 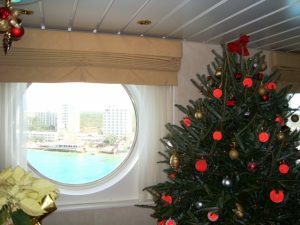 Our friends Dale and Linda Bixler joined us for an 8-day cruise just before Christmas and we had a wonderful visit. It was fun showing them the stomping grounds of San Juan, St. Thomas, St. Maarten and Labadee – and fun replacing the digital camera! Hence we have some pictures to share again. They were kind enough to give us our 12th Monopoly game – this one a new edition with no cash – just a little computer and an “atm” machine! Cool. 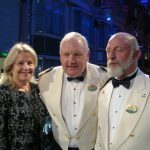 Captain Arnolf Remo and his wife, Tove, joined the ship in early December, and we organized making Krumkake together in our cabin for the few Scandinavians we have aboard. 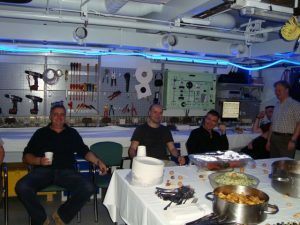 The ship did a great job of organizing special Scandinavian food on Christmas Eve in the officer’s mess for Arnolf, Tove, Johan (from Sweden) and his wife, and the few others aboard. 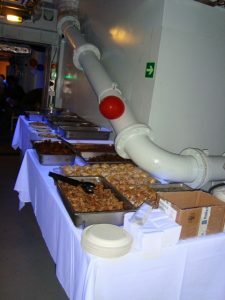 And the week between Christmas and New Year was feast after feast of holiday food from all over the world, served in various parts of the ship. Roast pig for the Phillipinos; steak and salmon tartare for the Poles; seafood and pasta for the Croats and Italians; and music everywhere. 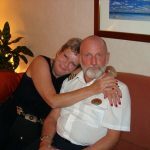 We really like the philosophy onboard Independence of letting people feel like family while they’re so far away from home. New Year’s Eve was really spectacular. 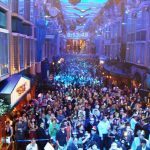 The “Royal Promenade” along the center of the Independence was packed with at least 3,000 people, the orchestra was playing, the Cruise Director and his team were out in force for the countdown, and Captain Remo, Staff Captain Johan, Chief Ole, and their respective families were all invited to descend from the skybridge for the countdown ceremony, balloon drop, and champagne toast. I’m sure it was more crowded than Times Square – sure felt like it. Perhaps the most amazing part of the whole thing was the fact that it was cleaned up and sparkling not two hours later – as if the whole thing never happened. 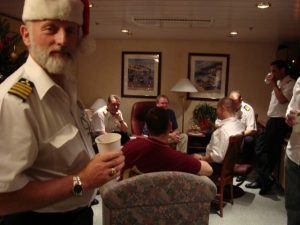 Wish I had staff like that on OUR boat! Happy New Year to All – and may we experience love, joy and prosperity, every one of us!